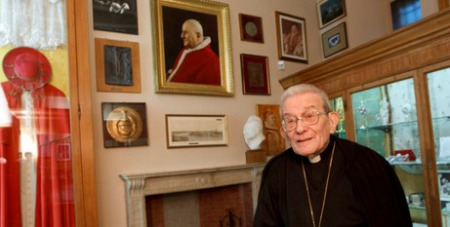 The former secretary to St John XXIII and the oldest member of the College of Cardinals died yesterday at the age of 100, reports the Catholic News Service. Italian Cardinal Loris Capovilla, who served St John XXIII before and after he became Pope, died in Bergamo, near Milan. “Capovilla has devoted his whole life in the style of [Blessed John XXIII] to keep alive the dialogue with the great religious tradition of Judaism; with the community of Taizé in which he made a gift of a Pope John compendium which, I can testify, was held in the cell that was of Brother Schutz; with the various Orthodox Churches," he wrote. When the freshly named patriarch of Venice, Cardinal Angelo Roncalli, chose 37-year-old Father Capovilla as his private secretary in 1953, a sceptical adviser told the Cardinal -- who would become Pope John XXIII -- that the priest looked too sickly to bear the strain of his new job. But the Cardinal outlived his employer by half a century and was a dedicated custodian of his legacy, running a small museum dedicated to the saint's memory in the late Pope's native town of Sotto il Monte Giovanni XXIII, near Milan. A friend and confidant, he was by the Pope's side during a pivotal point in the church and the world's history: for the launch of the Second Vatican Council and the escalation of political and military tensions of the Cold War.